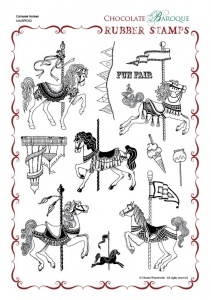 This rubber stamp set contains 6 images of carousel horses together with a pennant banner, an ice cream cone, a toffee apple and a helter skelter. 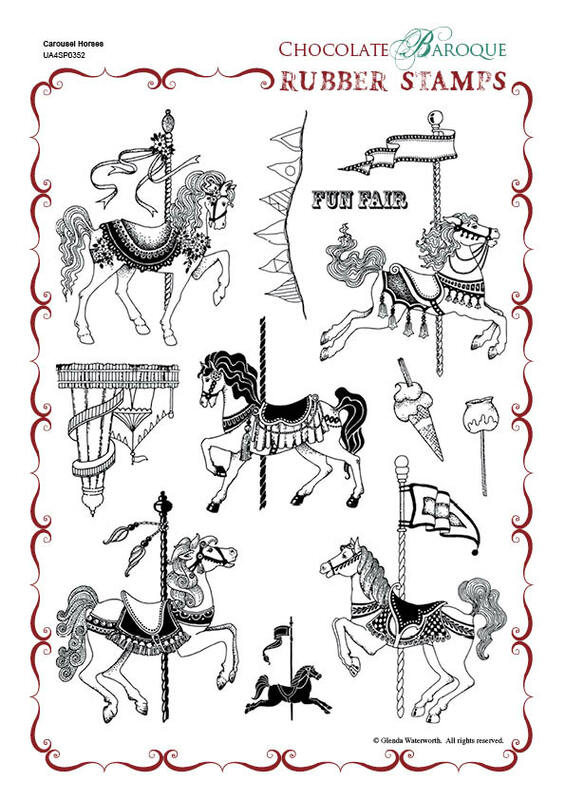 These resplendent horses are suitable for many occasions including childrens' birthdays and as part of a scrapbook project or journaling page. Great images for children to stamp and colour. Beautiful detailed stamps - I was immediately drawn to these images and haven't seen anything like them anywhere else. Fantastic delivery too - came really quickly! Lovely stamp, lots to choose from. Looking forward to using distress markers on the next card i make using this. I love CB's stamps. Their images are clean and clear which makes for a crisp image on any surface! I have a thing for butterflies and peacocks and lately after seeing a carousel horse card I liked, I went looking for horse images...and immediately went to CB because I knew they would have different unique images! I love these, they are all so detailed! I will be back for more amazing stamps! I have always wanted a set of carousel horses and when I saw these I just had to have them. I was a little put off by the fact that I had to mount them myself but once done and I tried them out I was very pleasantly relieved. A good clear image even though the horses are on the large side. Buy them, use them Love them! Gorgeous stamps. Crisp, clear and beautiful. As soon as I saw these stamps they went on my wish list and became a Birthday present from my discerning Hubbie!The horses are drawn so beautifully and each one has a different character;my favourite is the delightfully feminine one with delicate hooves and flowers in her mane.Let your imagination run riot with these extra-special images!